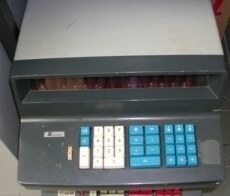 This ETR222, our third Soemtron calculator, is complete but it has a slightly damaged keyboard from a lifetime of use. It appears to be one of only four Soemtron ETR222's existing that we know of from the original 3,203 units that were built. It has a serial number of 74005, which we believe places it roughly half way through the production run of the Soemtron ETR22x series, sometime in 1971 possibly about week eight or nine. The base panels of the Soemtron ETR220 and 222's all seem to be the same, so we think the serial numbers were assigned to the bases before the machines were actually built, this theory seems to fit with the serial numbers and date codes of the machines we have, although admittedly this is a rather tenuous assumption! September 2017 - Reverse engineering our Soemtron 222 is underway and initial results have confirmed that the 222 is in fact derived from the ETR224, not the ETR220 as we thought some while ago. Several of the main PCB's are labeled "224-" and several "22 -" ("4" scratched out), with several being at the same issue level as the corresponding PCB of the ETR224. The power supply is a fairly conventional series regulated unit, with outputs of -12V for the logic, +12V bias, and +13.5V for the core memory circuits and drivers. A fourth supply provides approximately +180Vdc for the display nixies. This display potential is actually split into +/- 90V DC rails. Using the standard continental mains input connector for the time, the power supply has an internal input voltage selector for 110, 127, 220 and 240V AC. moves to a new location under the numeric 1 key left of the now slightly smaller zero 0 key. The current decimal point position (overlaid 0 and 1 digits to show as a "barred" 0), is now not visible in the display during numeric input. The 220 "Raise to Power" function key Xn has been removed. For powers on a 222 the base number X is first keyed in, then for the exponent n, the multiplication key is pressed n-1 times, then the equals key once. This key position has become the "return constant" ∇ key. Lastly the key position on a 220 for the "sign or negate entry key" -# becomes the "Exchange operands" # key which swaps the contents of both operand registers. Whilst reverse engineering our 222 back to a circuit diagram, we found several of the keyboard micro-switches were not working on the common return line KBD(K), most were down to contact oxidisation of the normally open contact from years of not being used, however, one was found to have what looked like a couple of maggot like larval carcasses and fiber debris. How this wildlife debris got inside what effectively is a sealed switch we don't know but cleaning it out brought the switch back to operation. 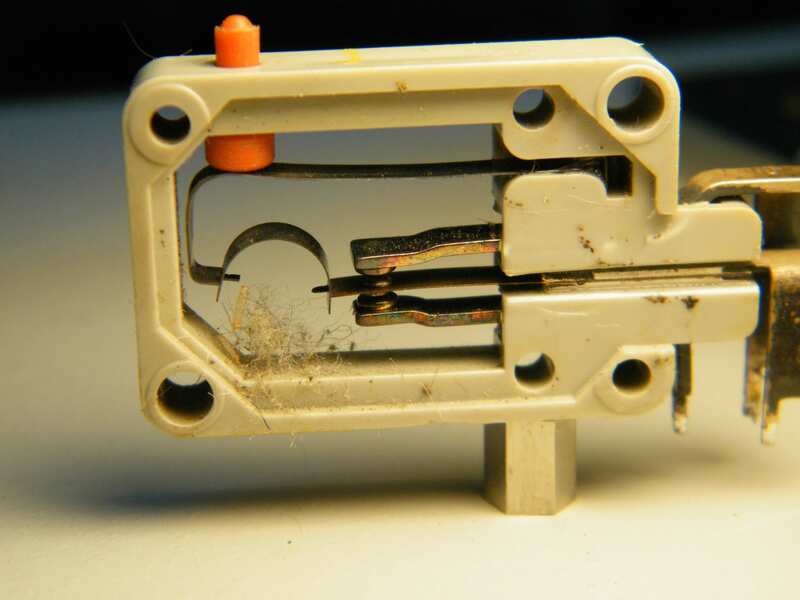 Long term oxidisation of switches can be "electrically" cleaned by passing a relatively high but limited current through them, something in the order of 300mA. This process somewhat resembles the old process of providing a "whetting" current for switch and relay contacts specifically to punch through contact oxidisation. Keyboard circuits within the Soemtron ETR series calculators typically only have 0.8mA flowing as a "whetting" current, not nearly enough to perform this function. We have made up a small jig for this purpose but it does mean the switches must be removed from the keyboard assembly. The jig is configured to pass 300mA & 30V through the contacts, with a couple of LED's to show when the switch is working. Initially one or both of the contacts, usually the normally open, will not give a LED indication (from the oxidisation), subsequent repeated operation of the switch should bring it back to life within a few cycles and we have found this process to be quite effective. Switches that do not respond can also be manually cleaned with a contact cleaner, but you will need to carefully remove the clear side covers by prising off the the side that has the heat welded location pins. With care the weld will snap easily and the cover removed, on replacing fix with a small amount of a clear super glue at the site of the original welds. The display consists of 15, Z570M Nixie tubes, a power "ON" neon, "negative" result lamp and 10 fixed position decimal point lamps. Each Nixie tube displays the numbers 0-9 in 13mm (0.51") high digits using a supply of 180Vdc at approximately 2mA. Each digit is a shaped metallic cathode of the required numeric shape and is commoned onto a multiplexed signal buss, with each numerical digit having its own individual inverter driver. The Anode for each Nixie tube is also separately driven via fifteen individual drivers, whose control signals are again derived from a multiplexed data buss. The ten Decimal Point lamps are directly switched from the last wafer of the front panel decimal point selection switch via a short cable loom and interconnecting 13pin plug and socket. The other three wafers of the decimal point selection switch encode eight signal lines for the main calculator control logic. Board 1 contains the four read amplifiers HV1, 2, 4 and 8, wired directly to the read wire connections in each plane, they convert the EMF signal seen on a plane's read wire from the resulting polarity reversal of a core during a read operation. Two core memory drivers are also on this board, BL2 and BL4, which perform the "blocking" or inhibit functions for core planes 2 and 4 used for bits 2 and 4 of of each BCD (1248) word in memory. The board also contains 3 AND gates (2x 4 input and 1x 3 input) numbered K3, K4 and K5 which generate signals DGDRV2 , DGDRV2 , DGDRV4 from the A and C registers used by the cathode drivers multiplexing the 2, 3 and 4 grids within each of the 15 display Nixies. The PCB is marked ETR224 on the component side, and 3033- 220-317-001c on the solder side. It appears that this board was used across the whole range of Soemtron ETR22x electronic calculators. This board contains twenty of the twenty two memory drivers need to operate the core memory of a Soemtron 222. Each driver consists of a decoding logic gate, pulse amplifier, isolation transformer and driver transistor which then activate a corresponding wire in the core matrix according to the required function. A 4uS monostable on the board through inverters N1 and N2 generate timing signals T and T which are fed to all the driver input logic gates to ensure the correct pulse width and timing of the appropriate signals when applied to the core matrix. Each driver has a 3 or 4 input AND gate to decode that drivers function which covers Read, Write, Register addressing (MD, MR, AC0, AC1, AC2, AC3) and Inhibit actions. The PCB is date coded 40/68 and marked 3034- 220-317-002d on the solder side. The six flip-flops of board 3 contains are constructed from pairs of cross coupled PNP transistors with associated control gating, signal buffering and pulse circuitry. The flip-flops are labeled B1 , B2 , B3 , B4 , VOR and Unknown on the logic diagram and appear to be used for the following functions - Add, Subtract, Multiply, Divide, Equality and raise to power functions and two as yet undetermined functions. There are fourteen gates of varying complexity ranging from single diodes to a four input AND-NOR gate, the functions of some of these gates are yet to be determined. D?? - 1 input OR from KBD(Lö1) to reset the A8 flip flop on board ? The PCB is date coded 25/69 and marked 3966- 22 -307-003d on the solder side. Board 5 contains five cascaded Flip-flops connected as a five bit BCD counter. Each flip-flop is constructed from pairs of cross coupled PNP transistors with associated control gating and signal buffering and pulse circuitry. Its function is to generate a four bit BCD count (0-15) for the nixie display and a five bit count (0-31) for calculations. Complex input gating to the Z counter determines the initial state and operating conditions of the Z counter during calculations, but for display purposes, the counter purely cycles through a repetitive 1 - 2 - 4 - 8 sequence deriving the signals for the multiplexed display anode drivers on the display decoder board. This dual use of the Z counter for both display multiplexing and calculations give the Soemtron ETR220 and 222 calculators their distinctive "ripple" effect in the display during larger calculations, especially multiplication and division. Further gating or another counter would have meant a cleaner display but at the expense of more logic and components, increasing costs. The Flip-flops generate signals Z1, Z2 , Z4 , Z8 , Z16 and S16 with their complements - Z1 , Z2 , Z4 , Z8 , S16 . The PCB is date coded 14/69 and marked 3965- 22 -307-004c on the solder side. Board 5 contains four latches and various AND-OR gates, it also contains the 25KhZ system clock generator. The function latches are labeled R , F6 with 2 as yet undetermined functions. There are six other gate groupings on board 5 along with six inverters. The PCB is date coded 34/68 and marked 3960- 224-307-005a on the solder side. Board 5 contains six latches and various gates and inverters. Four of the flip flops are connected in a 4-bit counter which on an ETR224 formed the print wheel position reference WCNTx and WCNTx . Its use in this ETR222 has been disabled so presumably the board is retained for the remaining latches and gating functions. The remaining flip flops are for M and one other as yet undetermined function. There are eight other gate groupings on board 6 along with nine inverters. Lastly a resistor capacitor network for the keyboard CLEAR key, located here presumably it was either left off the keyboard decoding circuitry or there was limited space. The PCB is date coded 35/68 and marked 3969- 224-307-006b on the solder side. Board 7 contains four Flip-flops forming the "A" register (Ausgabe or output? result) of the Arithmetic which is BCD encoded as A1 , A2 , A4 , A8 and their complements A1 , A2 , A4 , A8 . The A register is closely coupled to the E register on board 8, forming the Arithmetic unit of the machine, multiple SET inputs to each bit of the A register are disabled when used in the ETR222. Four AND-OR-Invert groups decode and generate the signals for the "C" buss, C1 , C2 , C4 and C8 , also part of the arithmetic logic unit. The PCB is date coded 33/68 and marked 3959- 224-307-007a on the solder side. Board 8 contains five flip-flops constructed from pairs of cross coupled PNP transistors with associated control gating, signal buffering and pulse circuitry. Four of these flip-flops are the "E" register (Eingang or input?) used to store BCD encoded numbers as E1 , E2 , E4 , E8 and their complements E1 , E2 , E4 , E8 , during numeric entry. 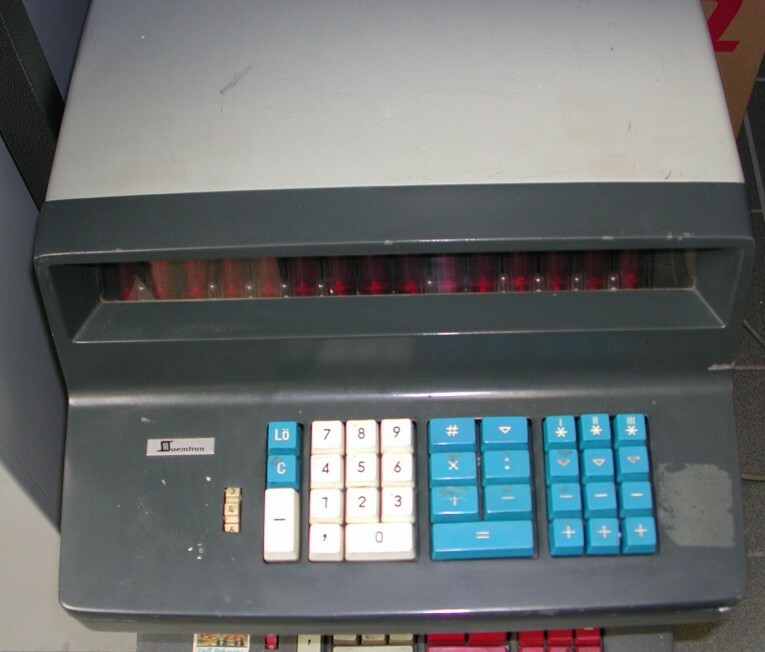 The E register in concert with Board 7, the A register, forms the main arithmetic processing unit during calculations and data manipulation, with the E register being used for bit carry operations as data bytes are fed to the A register. The fifth flip flop is function UV the function of which is yet to be determined. Decoding logic for the special "barred zero Ø" or "zero one" digit used to represent a decimal point in the display during a numerical entry is also on this board along with other display and control related logic. The PCB is date coded 40/69 and marked 3952- 224-307-008a on the solder side. Board 9 contains three flip-flops constructed in the usual manner from pairs of cross coupled PNP transistors with associated control gating, signal buffering and pulse circuitry. The READ/WRITE (Les - Schreib) flip-flop controls the operation of the core memory planes on board 1 via the drivers on board 2. The functions of flip-flops S1 and V are yet to be determined. There are five AND-OR-Invert gate groupings whose functions have not yet been determined in the overall logic flow of the ETR222. In all cases between two and eight multiple input AND gates feed a corresponding OR gate followed by one or more inverter buffers deriving the AND-OR and NOR functions. The PCB is date coded 04/68 and marked 3958- 224-509-009c on the solder side. Board 10 contains a single flip-flop constructed in the usual manner from pairs of cross coupled PNP transistors with associated control gating, signal buffering and pulse circuitry. Flip-flop MZ controls the operation of [?]. There are five AND-OR-Invert gate groupings whose functions have not yet been determined in the overall logic flow of the ETR222. In all cases between two and eight multiple input AND gates feed a corresponding OR gate followed by one or more inverter buffers deriving the AND-OR and NOR functions. There are seven AND-OR-Invert gate groupings whose functions have not yet been determined in the overall logic flow of the ETR222. In all cases between two and eight multiple input AND gates feed a corresponding OR gate followed by one or more inverter buffers deriving the AND-OR and NOR functions. A 20 input AND-OR-Invert group consisting of five AND gates (all K??) feeding OR gate D?? and inverters N46, N47, N48 to generate signal ADD , ADD1 and SUB used by the E Register. A 7 input AND-OR-Invert group consisting of four AND gates (all K??) feeding OR gate D?? and inverter N44 to generate signal AC used by the ZAC1, ZAC2 and ZAC3 drivers in the memory core. A 6 input AND-OR-Invert group consisting of four AND gates (all K??) feeding OR gate D?? and inverter N?? to generate signal MDS used by the ZMD driver in the memory core. A 6 input AND-OR-Invert group consisting of four AND gates (all K??) feeding OR gate D?? and inverter N38 to generate signal MRS used by the ZMR driver in the memory core. A 6 input AND-OR-Invert group consisting of four AND gates (all K??) feeding OR gate D?? and inverter N45 to generate signal AC0 used by the ZAC0 driver in the memory core. The PCB is date coded 34/68 and marked 3957- 224-307-010c on the solder side. Components D54 and D129 have been used twice on the board legends. Board 11 contains four flip-flops constructed in the usual manner from pairs of cross coupled PNP transistors with associated control gating, signal buffering and pulse circuitry. There are also five diodes in three partial gates with other gates on boards 3, 6 and 12. Flip-flop UBER is the temporary store of carry and borrow bits from arithmetic operations. Flip-flop F2 controls the operation of [?]. Flip-flop VER controls the operation of [?]. Flip-flop DOUBLE was used in the ETR224 to control the printer advancing two lines of paper, it's use in the ETR222 has yet to be determined. Two diodes form part of gate K? ?, the other part is on board 3 for the signal K(F3S16F4). Two diodes form part of gate K? ?, the other part is on board 6 for the signal K(S1UBERDIVZF1). A single diode forms part of gate K? ?, the other part is on board 12 for the signal K(UBERWCNT842). The PCB is date coded 20/73, and is marked 3043 05-222-7011-5 0g on the solder side. Board 11 contains four flip-flops constructed in the usual manner from pairs of cross coupled PNP transistors with associated control gating, signal buffering and pulse circuitry. These function flip-flops F3 , F4 and F5 control the operation of the mathematical operations. A 15 input AND-OR-Invert group consisting of three AND gates (all K??) feeding OR gate D?? and inverter N?? to generate signal M .
Components R26, R27, R35, R61 , R76, D105 and D106 are all missing form the PCB legends. The PCB is not date coded but is marked 224-307-12d 3971- on the solder side. The under keyboard PCB with the keyboard encoder, display decoders and drivers will follow over the next few months. Our machine currently undergoing restoration in the www.soemtron.org collection. One in a German on-line museum of digital equipment at the Digital Computer Museum, a photo of their ETR222. One owned by Serge Devidts on his website, his ETR222.